Festival on Ponce was something of a surprise. We were driving past it trying to get to a well known Little Five Points eatery, saw the tents, found parking a block from HD1 and hoofed it over to the festival. There were plenty of food trucks, some tent setups, with Williamson Brothers BBQ doing a tent as well as Red Brick brewing. 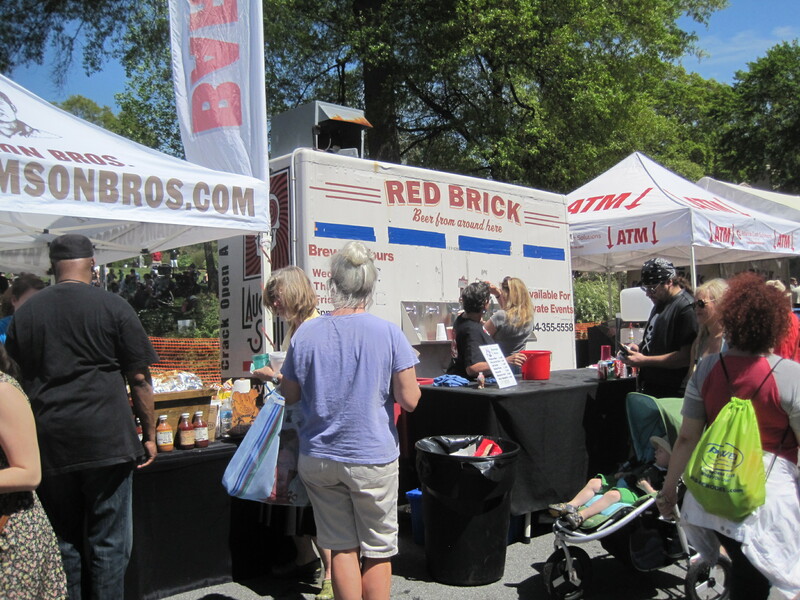 I had Red Brick’s amber ale, a good beer for a warm spring day, and a pulled pork sandwich from the Williamson Brothers booth. later, I had a few bites of the turkey leg that Williamson Brothers were offering. I felt it was the best of the barbecue offerings we tried. I’ve had plenty of turkey legs at Renaissance Festivals over the past 25 years or so, and I’ve yet to have a turkey leg as good as the one the brothers were serving this day. The difference was that the turkey was smoked, and the smoked flavor came through clearly in the meat. The pulled port was decent. There was bark and smoke flavor in the pulled pork, though clearly that product was aimed to be tender as opposed to richly smoked. I also ate at the Yumbii truck this day. They do Korean tacos and they’re good ones. Not blow you away good but respectable food. Unlike some other Korean tacos, these are not drowned in a sweet sauce. 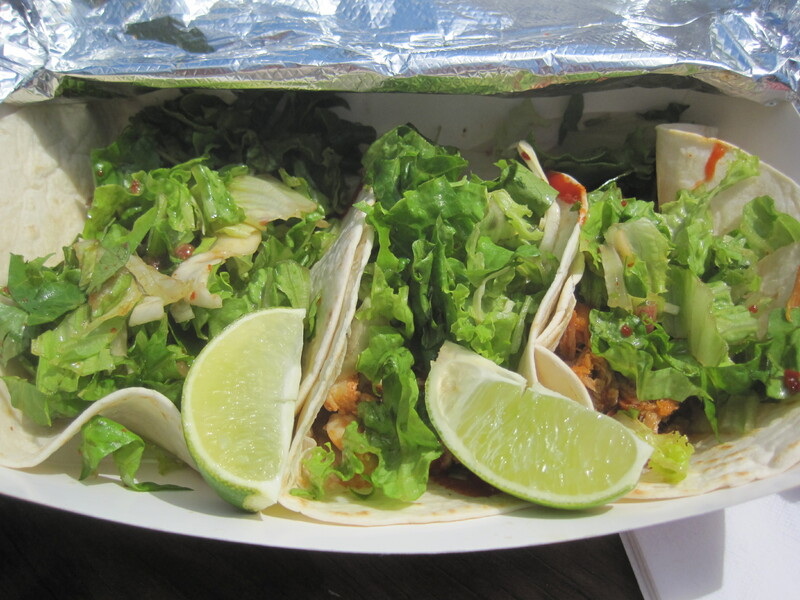 Further, the rich serving of leaf lettuce makes these tacos a desirable choice for someone like me, with carb issues. It’s part of the Assi Supermarket food court, but not the part facing the chairs and seating. Rather, Sky is in that section that looks out into the market itself. So, to get there, weave your way through all the boxes, pass China House (the noodle shop), and go round the corner. Sky BBQ, for my daughter and I, is about the duck. Chloe and Bliss got us hooked on Chinese duck, mostly by talking about how wonderful Canton Cooks is. The first ‘wor sue duck’ I had there was excellent, and it demonstrated the three virtues of a good duck: crispy skin, creamy liquid fats, and tender, chewy dark meat. This triple whammy is what I’m looking for when I cruise for duck. 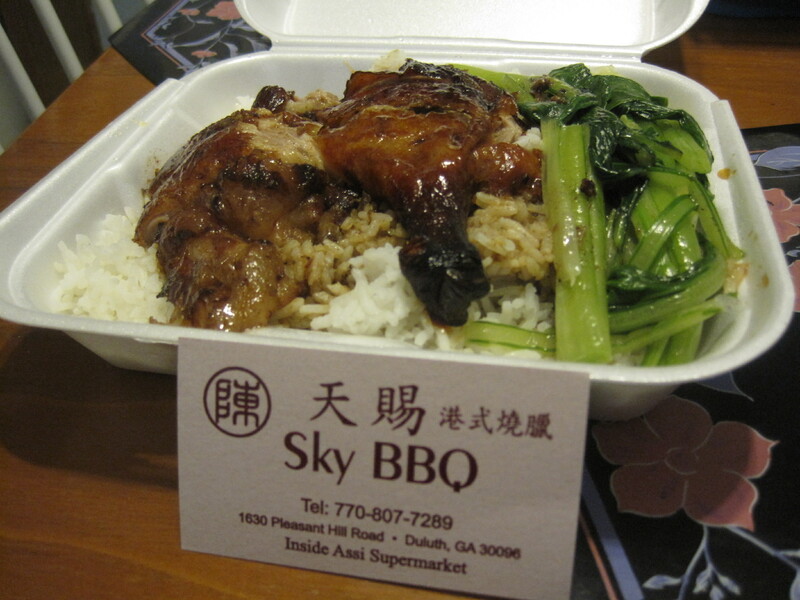 And yes, Sky BBQ delivers. Duck. Crispy, fatty, chewy, oh so good. There are no frills here. I got duck to go and my daughter and I ate when we got home. It’s good for a booth-style eatery in a supermarket. 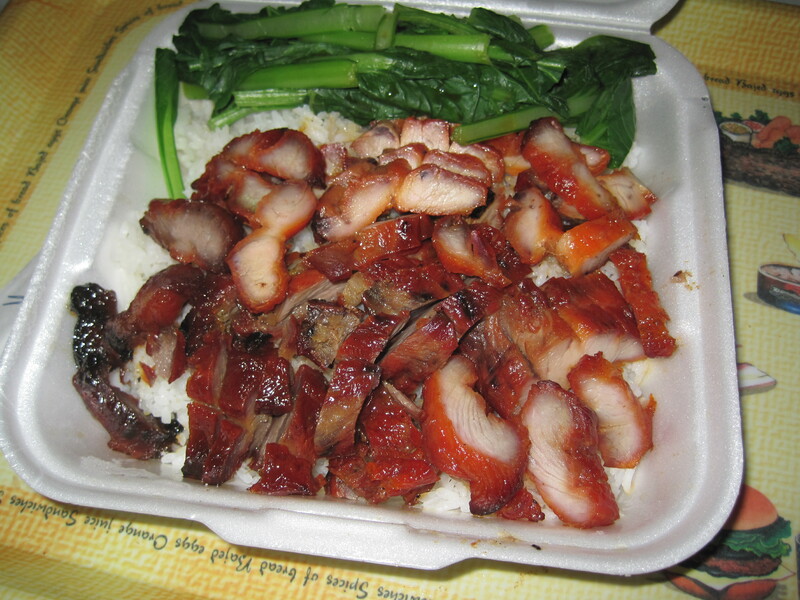 Yes, Ming’s BBQ is nearby and more full featured, but don’t forget the little duck spot in Assi if you have a hankering for the duck triple whammy. You can get plenty triple whammy at Sky BBQ. Just how diverse is the Atlanta barbecue scene? The Atlanta barbecue scene is badly underestimated, it appears, even by bloggers who blog in this city. From this perspective, it’s merely a boring repetitious set of chain eateries, whose products are predictable and monotonous, and whose only differentiating factor are the sides or perhaps the sauce. I have news for ya’ll: this also is Atlanta barbecue. See that dumpling? 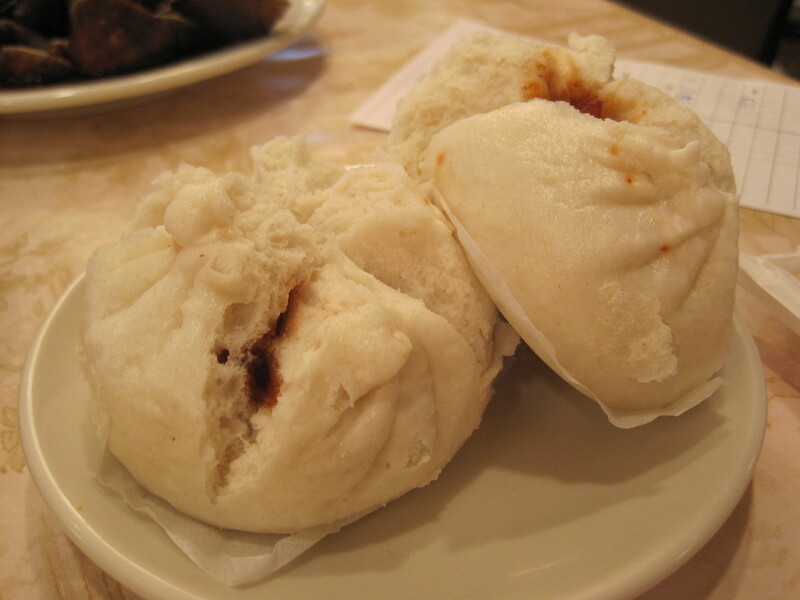 It comes from Canton House, the famous dim-sum place on Buford, and yes, it’s full of barbecue. In this city, perhaps you didn’t know, but the Koreans have barbecue, the Chinese have barbecue, and the Vietnamese add barbecued meat to their banh mi. meat on the "barby" at "Iron Age"
Since the work barbecue itself comes in part from the Taino people of the Caribbean, it also appears that the Southern style of cooking meat is also a direct descendent of the Caribbean barbacoa. That suggests strongly that jerk chicken, from Jamiaca and smoked, is also a style of barbecue. 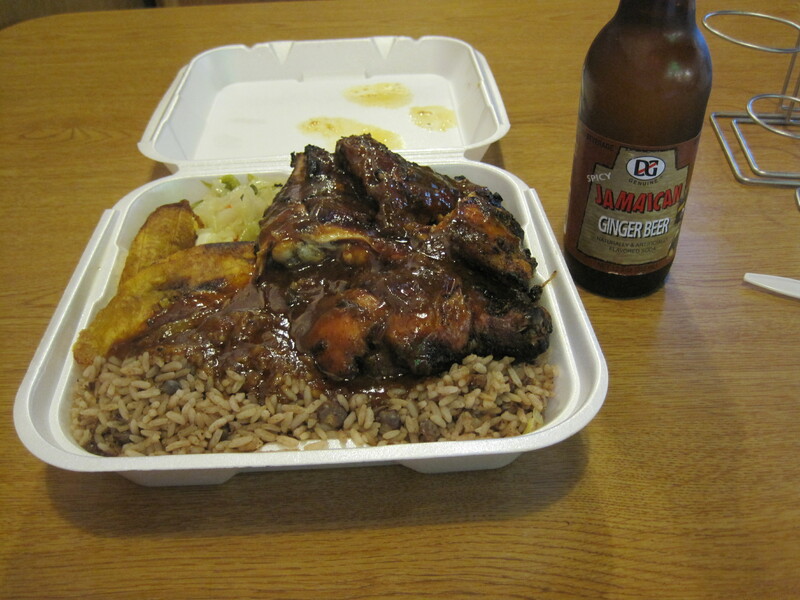 Tastee's (Snellville) jerk chicken: Is this a kind of barbecue? Is it or isn’t it? I’m not claiming barbecue expertise. I’m merely a student in this genre. What about pastrami? It’s a smoked meat, isn’t it? How closely related is pastrami to barbecue? Even restricting the point of view to “Southern barbecue”, I’ll note that there are two common ways to prepare meats in this “style”, and that is to smoke the meat indirectly (leads to a smoke ring and great smoke flavor), or to broil the meat and then finish it on the grill (grill lines, and fall off the bone tender). The latter is indeed favored by chain restaurants. It’s easier, and you’re in no danger of running out of product around 3 pm in the afternoon. They’re easily distinguised, by the presence or absence of smoke rings on the meat. When visitors from Carolina and Tennessee come to Texas, they are generally astonished to find that we eat a lot of pork here as well as beef brisket. That’s the problem with the beef generalization. Yes, we barbecue beef – but we’re fond of other meats. I know this to be true, for when visiting relatives in Granbury, Texas, I had some good pork ribs over in Glen Rose. Pork ribs from Glen Rose TX. The smoke ring is clearly visible on these ribs. If you talk to bloggers who actually smoke meats in their spare time, they’ll note a merrily promiscuous character to Atlanta barbecue. The city doesn’t appear to care what is good, it just adopts any style that tastes good. So I’ll reiterate the question that comes to me after all this: just how many different kinds of barbecue can you count in this city? I’ve been finding interesting links and mailing them to myself. They’ve been accumulating in an email inbox, useless to anyone. But to dig down into these links and pull out a few of note. This is a quote from the New York Times article on adobo, the Filipino chicken dish. Husbands argue with wives about adobo. Friends shoot each other dirty looks about the necessity of including coconut milk or soy sauce in the recipe. There are disputations over the kind of vinegar to use, over the use of sugar, over the inclusion of garlic and how much of it. Some use chicken exclusively in the dish, others pork, some a combination of the two. Adobo is commonly seen in fiestas (parties) in the Marianas, and my wife is half Micronesian. Of course I’m interested. More Filipino goodness is this blog article on the Filipino New Years. Great pictures! And Hopeless Foodie (Filipino step mother) has an article on making lumpia. For those interested in sushi and thus the fate of the bluefin tuna, widespread reports of quota cheating (see here, here and here) certainly dim the prospects of seeing bluefin stocks recovering. Since one of the comments Tony Bourdain makes in his last book is a lament, on why can’t smart chefs incorporate interesting but less popular fish, such as mackerel, into their menus, we then find that people are cheating when it comes to the mackerel catch too. So life goes on. To note, the Monterey Bay aquarium keeps a list of sustainable fish, foods safe to eat. I don’t know how many of you have seen the fake food ads on Amazon.com (not for the squeamish). Samples are here and here. From this article, Marilyn Monroe could cook. It appears as if this recipe was inherited from the DiMaggio family. Roger Ebert, the well known movie critic, has lost his jaw and can no longer eat. But he still entertains and still cooks. This is an article about Ebert’s new cook book. Northern Mississippi Commenter doesn’t often talk about food, but when he does, I listen. In this case he’s talking about what he considers to be good BBQ (or not) in Mississippi. 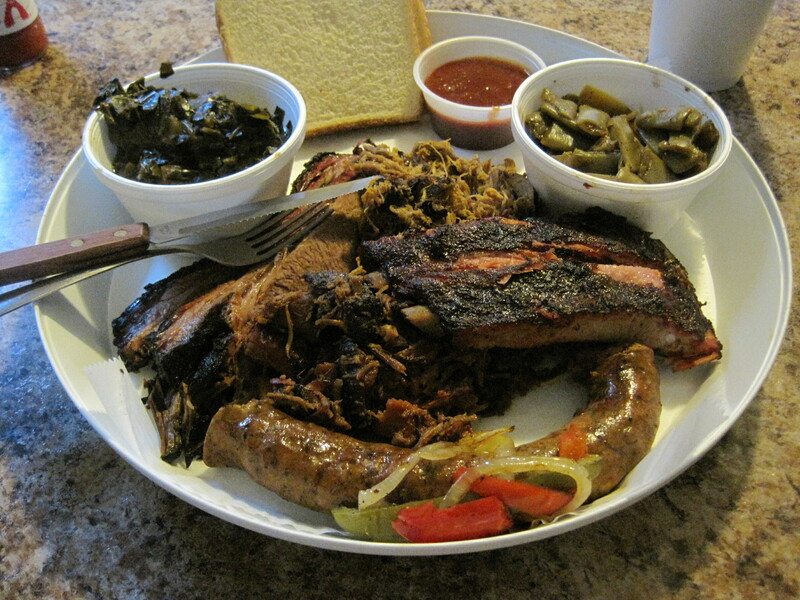 Good barbecue is worth a bit of a drive, even in lousy weather. My wife was talking about barbecue, wanting barbecue and I was wanting to not take any chances. It had been raining off and on all day and I didn’t want to travel too far. But traveling for ordinary food and traveling for barbecue are two separate things. Fox Bros BBQ was close enough to Little Five Points to make me worry about parking. Fox’s lot has been described in a couple blogs as “chaotic”. But my wife hadn’t had good ribs in ages, it was a holiday weekend, and the opportunity was worth a little risk. I used an online mapping service, obtained directions to the restaurant, and we dove into the middle of Atlanta down highway 78. I almost ran past the place, and luckily slowed down in time to make the second entrance. Once we did, a car signaled that it was about to leave, and we waited, waited, and got a spot in a totally crowded parking lot. Once in the restaurant, they told us it would be a 15-20 minute wait. Clouds were overhead, and as we waited outside, I kept glancing at the sky, hoping it wouldn’t rain. Fox BBQ is a place with a formidable reputation. When the AJC published an article about the Atlanta BBQ club, the “kill a tree” version had pictures of the club founders at Fox BBQ. When the AJC recently asked who had the best BBQ in Georgia, Fox BBQ was easily in the top 10, without a single complaint. Creative Loafing has reviewed Fox at least three times. There are multiple bloggers who have commented favorably on the place (reviews are here, here, here, here, and here). Once we were seated, things began looking up. We got drinks and I made sure to order the fried pickles. Drinks and pickles came quickly and my wife ordered the half rack of ribs ($13.95). I ordered the 2 meat plate ($14.95), with beef brisket and pulled pork, and my daughter ordered a pulled pork sandwich ($7.95, if I recall correctly). So we then tried the pickles and they were surprising, surprisingly sour and suprisingly good. I wouldn’t have believed the flavors would work with the ranch dip either but they did. Even my daughter, who was a bit aloof initially, made sure she had her share of the pickles. When the entrees arrived, amidst the sound of rain and the flash of lightning, I knew we wouldn’t finish them. The serving size was enormous. 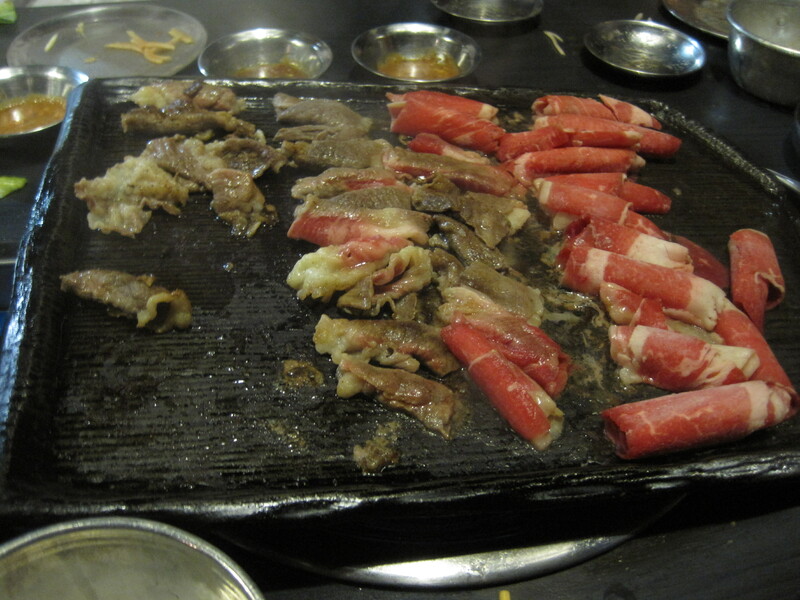 But we tried each of the meats in turn. The pulled pork had a real crust, had a smoke ring, and was melt in your mouth tender. The brisket had a smoke ring and had real smoke flavor. 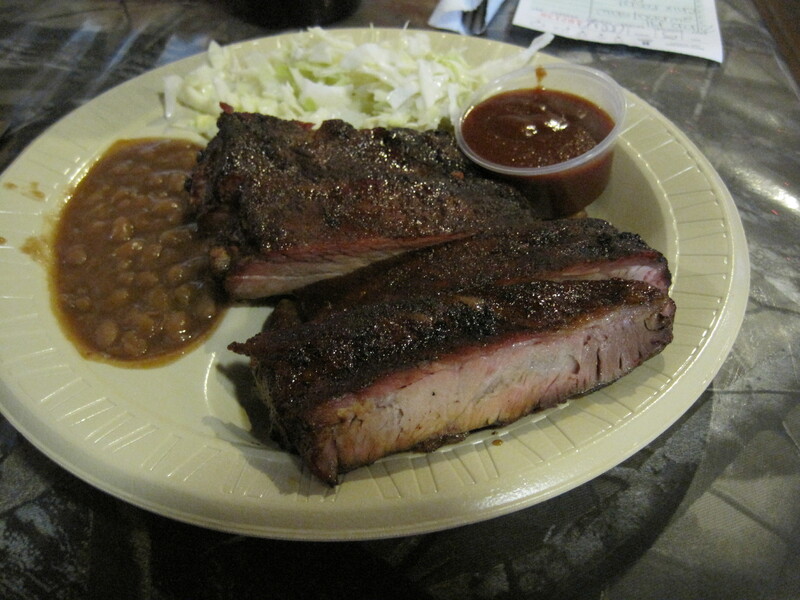 The ribs, sometimes described as dry, were smoky, tender and juicy all at the same time. The sides were excellent. Great baked beans, great collard greens, a good jalapeno corn bread, and the green beans were mixed with a little tomato and a little heat. The fried okra were okra split lengthwise and then coated in batter and fried. They were all excellent, and about the only place I could compare them to locally would be the sides at Matthews Cafeteria. The whole meal was, to borrow a baseball phrase, a home run. Service was excellent and the busing of tables incredibly fast. My wife loved our waitress and she’s usually the hard one to please. And yes, we took home food from every plate on the tables. We couldn’t finish any of it (well, I finished my pulled pork, but that’s it). Verdict: Highly recommended. Great entrees, excellent sides, service was top notch. Absolutely worth the drive from Snellville, even in the rain. Fresh Air is an inconspicuous restaurant in Macon Georgia, that is near exit 167 on Interstate 75. If you exit 167 while heading south, turn right on the feeder and follow it for 2-3 miles. When you see a Gold’s Gym sign and then a Longhorns, start looking. Fresh Air is a bit behind the Longhorns. The location of the restaurant is good, near the intersection of I-16 and I-75, and it is the winner, by far, of a AJC blog article that asked what the best barbecue in Georgia was. We have been traveling a bit recently and decided to stop here while passing through Macon. Inside, it’s as modest a restaurant as it was outside. There was an equally modest menu, with three plates, a BBQ plate, a pulled pork plate, and a chicken plate. My wife ordered the rib plate (around $9.20), I had the pulled pork plate (less than $7.00), and my daughter had their pulled pork sandwich ($2.49 iirc). On the table there were two barbecue sauces, one hot and one mild. 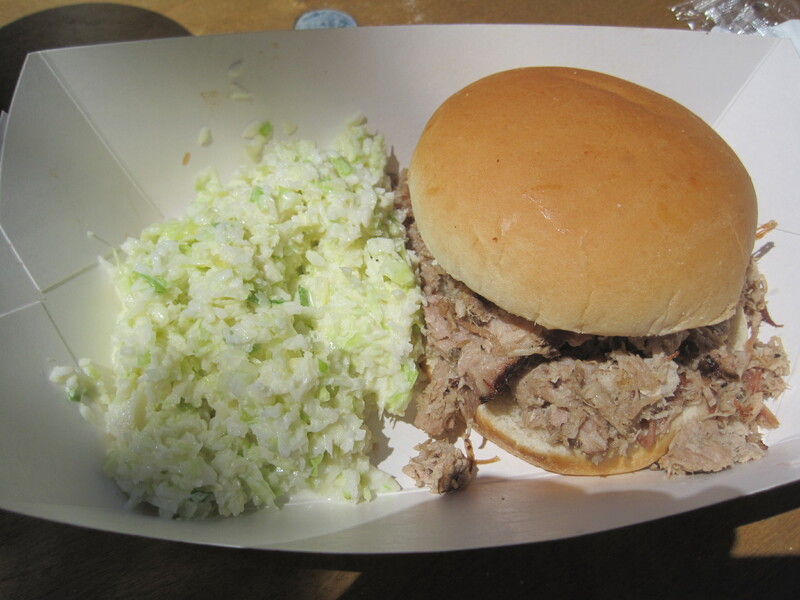 The pulled pork was moist and tender, and covered a bit with a reddish sauce. When I first tried the pork, the taste hit me and I wasn’t quite used to it. After trying the hot barbecue sauce, it became apparent that the sauce (and therefore the pulled pork) had a really big vinegar based kick. And though the first sensation you taste in the sauce is the sour of the vinegar, the sauce then gives a fair amount of spicy heat, showing a bit of complexity. I’m not much for vinegar sauces, but I liked Fresh Air’s sauce. I’ve never been able to eat Brunswick stew before, but I could eat Fresh Air’s Brunswick stew. My wife loved the beans she had. All the sides were good, in our estimation. The ribs were not bad, not the best. They were tender, but didn’t have as much smoky flavor as I’d like. My daughter gobbled down her sandwich. She obviously wasn’t complaining. Overall, I thought the restaurant was good. The inexpensive plates and especially the pulled pork sandwiches make this restaurant a great value, especially for families on a budget. This is an extended version of the list we published here. Scoring is described in the older article. In summary, each restaurant gets a point for a single approval noted in the AJC thread. A neutral response nets a half point. A negative response nets -1 point. Percentages are calculated via scoring 1 point for positive and a half point for a neutral response divided by the total number of votes of any kind (times 100). Some comments are worth noting. Score isn’t nearly as important as reading the thread and finding restaurants that fit your personal style. My family found Mad Dog’s BBQ in Conyers by noting the raving people did over their smoked ribs. Although 50 people liked Fresh Air, you may not. Although Louis Grizzard liked Sprayberries in Newnan, a lot of people didn’t like it. Individual tastes are too different for me to tell any one person what they personally will like. Each individual has to be their own judge.